It is one of the stranger results of global beer marketing that the biggest-selling beer in Brazil, which is also one of the biggest beers in Africa, from Algeria via Guinea to Rwanda, and is sold across large parts of Asia, from India via Malaysia to Hong Kong, began life more than 50 years ago in a small Scottish town on the north side of the Forth estuary. I doubt too many drinkers of Skol in Rio de Janeiro know that the drink that “goes down round”, according to its advertising, came originally from 6,000 miles away. Today a beer that was one of the pioneers of mass-market lager in Britain is seen in Brazil as so Brazilian that drinking it turns Argentinians into supporters of the Canarinhos. Skol is also huge across the South Atlantic in the Congo, where it inspires what I suggest may be one of the best music videos in support of a beer ever, by the too-little-known Bill Clinton Kalonji. (Give yourself eight minutes 33 to watch, and if you’re not grinning broadly by two minutes in at the latest, you can have your money back. The Portman group would turn into steam.) In Malaysia (where the beer is brewed by a Carlsberg subsidiary) and the Far East, meanwhile, it has been launched as a “value for money” brew. In Britain, Skol was the biggest-selling beer in the market 25 years ago. But it had fallen out of the top 10 by 2004 and is now a commodity lager, sold in cans at just 2.8 per cent abv to take advantage of the UK’s new low-alcohol tax band. Skol is currently the fifth best selling beer in the world, thanks to its popularity in places such as Brazil and the Congo. But in the country where it began, Skol is a sad, tired brand. The other curiosity is that brewery mergers and takeovers mean that Skol-the-brand is owned by Carlsberg in Britain and Asia, A-B InBev in South America, and UniBra, a Belgian company, in Africa. How all did this happen to a beer from Alloa? It’s a long story, and it properly starts in Burton upon Trent more than 110 years ago, where a substantial but struggling pale ale brewer, Samuel Allsopp & Sons, decided in 1898 to get into the lager-brewing business. Allsopp’s, the second-biggest of the Burton brewers (behind Bass), had been far too slow in reacting to the wave of pub-buying by other breweries that took place in the late 1880s and early 1890s, which gobbled up a big slice of its former free trade outlets. As a result it had seen a sharp loss of sales – by 1895 it was brewing only half the volumes it had been selling in the late 1870s – and was suffering from serious over-capacity. A new chairman was appointed that year, the Hon Arthur Percy Allsopp, aged 34, Old Etonian seventh son of the first Lord Hindlip, Henry Allsopp. Percy set about buying pubs, paying more than £1.7 million in five years for 323 outlets. This was very much more than the going rate per pub, and a strategy later described by The Economist as “insane”. He also decided that Allsopp’s should start brewing lager, to use that spare capacity, and after trips to look round breweries in Germany and the United States, plumped for the very latest in kit from the Pfaudler Vacuum Fermentation Company of Rochester, New York. The new lager brewery, erected on the “Old Brewery” part of the Allsopp site in Burton at a cost of £80,000 (equal to £80 million today), could turn out 50,000 to 60,000 barrels a year, “sufficient lager beer to supply almost the whole of the country”, using “a rapid system of maturing which is greatly favoured in the United States” that would send the beer out with just 14 days’ lagering, against the two to four months seen in Germany. The new lager brewery was finished by August 1899, and officially opened that October. It seems to have made both Pilsner and Bavarian-style beers: in December 1899 Allsopp’s “presented 600 dozen pint bottles of their pale and dark lager” to 500 Volunteers off to South Africa to join the British forces fighting the Boers in the Second Boer War. However, the new lager brewery failed to revive Allsopp’s fortunes, and in 1900 Percy Allsopp resigned. Total barrelage continued to fall, although the amount of lager produced increased: even so, the Allsopp’s historian Ray Anderson estimates that despite “considerable” advertising, sales never topped 40,000 barrels a year. In 1913 Allsopp’s briefly went into receivership. But John Calder from the Scottish brewer James Calder and Co of Alloa, was brought in by the receiver, Sir William Barclay Peat, to be the new chairman, and under his leadership the company began to turn around. In 1920 Calder also became the chairman of the Alloa brewer Archibald Arrol. A year later, Allsopp’s lager brewing kit was transferred to Arrol’s site in Alloa, together with Allsopp’s Swedish head lager brewer, Joseph Lundgren. There it continued to brew Allsopp’s lager, though in 1927, a new brand was introduced, Graham’s Golden Lager. This took its name either from Colonel Graham, Allsopp’s agent in London, or Willie Graham town clerk of Alloa, depending on which legend you wish to believe. Allsopp’s actually acquired Arrol’s in 1930. Then in 1934 it merged with Ind Coope, which had been brewing next door in Burton since 1856, to form what, at the time, was the biggest brewery company in the UK, with 3,400 tied houses. Lager continued to be only a minute fraction of the British beer market, even after the Second World War, but Graham’s remained one of the leading brands. All the same, Ind Coope, perhaps prompted by the drive by the Canadian entrepreneur Eddie Taylor to promote his Carling’s Black Label (sic) lager in Britain, spent £1 million over four years from 1955 rebuilding its two lager plants, Arrol’s in Alloa (which received a new Swedish-made brewery) and Wrexham in North Wales (acquired in 1949), and in 1959 it launched a new brand: Graham’s Skol Lager. The “Skol” part was supposed to be derived from the Danish/Norwegian/Swedish toast word “skål“, equivalent to “cheers”: it reflected a trend throughout the 1960s and 1970s by British brewers to give their lagers a Continental-sounding air. (Oddly, the very first bottle labels carried the old Ind Coope Burton brewery “castle” trademark.) The “Graham’s” bit was soon sidelined, with “Skol pilsner lager” being promoted in what Ind Coope called “the biggest advertising campaign Britain has ever seen for any lager”, which was deliberately pitched at young people in a way that would not be allowed today. In 1961 Ind Coope merged with Tetley’s of Leeds and Ansell’s of Birmingham to form what would be named Allied Breweries. That gave Skol thousands of new outlets in the UK. But Ind Coope had been developing even bigger plans for its lager. In 1960 the UK had applied to join the European Economic Community, or Common Market, the customs union encompassing France, Germany, Italy, Belgium and the Netherlands that was the forerunner of the European Union, only to be vetoed by Charles de Gaulle, president of France. Ind Coope had apparently hoped that if Britain joined the EEC, that would allow it to sell its lager in Europe. Ind Coope’s commercial director, Robert Eades, frustrated by De Gaulle, looked instead at markets outside the EEC and, as he told The Times in 1967: “Suddenly it went click. Why not an international beer?” From that was born the idea of one beer, brewed in different countries but with the same character and standards, under the common name of Skol. Previously, big-selling international lager brands such as Carlsberg, Becks and Heineken had been brewed in one country and exported. But Eddie Taylor had shown, by brewing Black Label in the United States and Britain as well as Canada, that drinkers did not necessarily care where their lager was made. Ind Coope had signed a “technical alliance” with Eddie Taylor’s Canadian rival Labatt’s in 1958. In 1961 what was to become Pripp-Bryggerierna, the largest brewery in Scandinavia, joined the alliance, to be followed by Unibra of Belgium, owner of the largest brewery in what had once been (until 1960) the Belgian Congo. In 1964 the four groups met in Bermuda and signed an agreement to set up a company called Skol International. The same summer, Skol began to be brewed at a new brewery near Barcelona in Spain under a deal between Allied Breweries and the Spanish brewer Cervezas de Santander. In the autumn of 1964 the Skol consortium was joined by Portugal’s Sociedade Central de Cervejas, which had links with South American brewers as well as the then Portuguese colonies of Angola and Mozambique. By 1967 Skol was being brewed by 20 breweries in 14 countries, including Austria (by Brauerei Schwechat, Anton Dreher’s old concern), Algeria, Australia (by Perth’s Swan Brewery), the Netherlands and Greece, and drunk in 36, with new breweries to make the beer being built in Italy (at Ceccano, 40 miles south of Rome) and “Persia”, as Iran was still known. Talks were going on with brewers in France, Germany (with Dortmund Union), Yugoslavia, Sardinia and Columbia, while three requests from Indian firms to join the Skol consortium were sitting on his desk, Eades told The Times. Skol International attempted to maintain strict quality control over each brewer, with the Schwarz Laboratories in New York, owned jointly by Labatts, Allied and Pripp, testing samples of Skol from new members of the consortium “exhaustively” until satisfied. One firm in 1967 was supposed to have been waiting 18 months for the green light, with 28 trial brews tested and rejected. Eades admitted to only one serious failed launch: in New Zealand in 1964, where “a lack of market research” meant that the local Skol “did not coincide with local taste”. In May 1967 it was announced that Skol would “soon” be brewed in Brazil for the first time, by Brazil’s Caracú group, at its breweries in Rio de Janeiro and Londrina. Caracú’s biggest-selling beers at the time were darker lagers, but Brazilians took to Skol quickly enough that in 1970 it was announced the Skol International consortium would be building a new £500,000 brewery in Manaus, Brazil, to brew 600,000 barrels of Skol a year, boosting total production of Skol in South America to 6 million barrels a year. In 1980 Caracú was acquired by its Brazilian rival Brahma, which linked up with its main competitor Antarctica in 2000 to form Ambev. Then in 2004 Ambev merged with Interbrew of Belgium to form InBev – now, after the takeover of Anheuser-Busch, A-B InBev. In Britain, meanwhile, Skol was one of the brands heading what amounted to a lager revolution, as a new generation of drinkers rejected the beers their fathers drank. 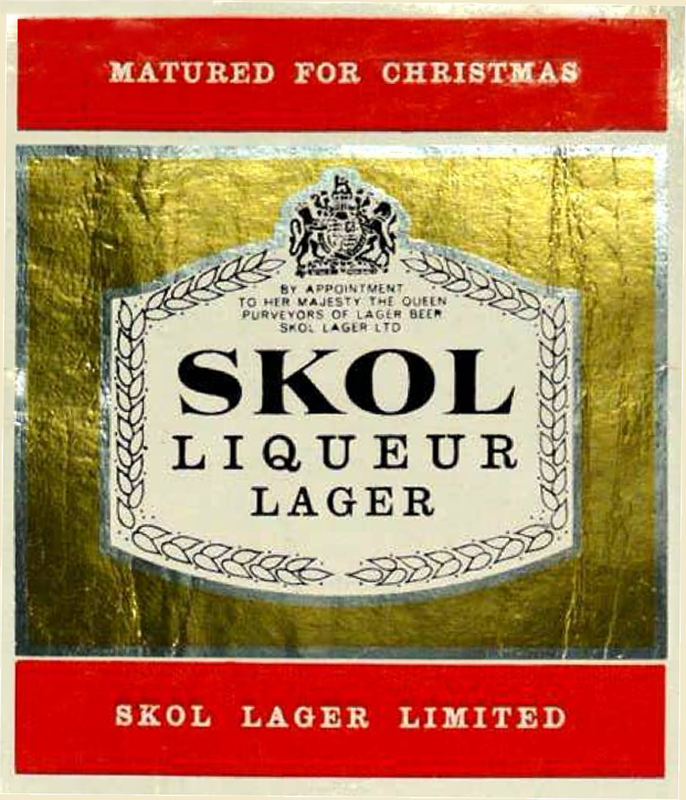 There was even “Skol Liqueur Lager”, aimed at female drinkers, as well as a stronger Skol De Luxe. But while Skol had 21 per cent of the UK lager market in 1967, and continued to be a leading contender for another 20 years, in the 1980s Skol was replaced by Allied as its main lager brand by the Australian Castlemaine XXXX, launched in the UK in 1984. In 2004, when Skol had more than 30 per cent of the Brazilian beer market, having been the biggest brand in the country since the 1990s, it was described in Britain as “an old-fashioned cheap supermarket brand”, barely hanging on under the ownership of Carlsberg, which had acquired the former Allied brewing empire. Last year Carlsberg announced it was cutting Skol’s abv in Britain from 3 per cent to 2.8 per cent, to fit in with the new reduced duty rate on beers of 2.8 per cent abv or below. So, Skol, born in Alloa, son of Graham’s Golden Lager, grandson of Allsopp’s lager of Burton upon Trent, once hugely popular in Britain but now spurned and despised at home, is the darling of Brazil, a favourite of much of Africa, and selling 9 billion bottles a year. I wonder if Kirstie Allsopp has ever drunk any of the beer her several-times great-uncle had a hand in originating. In 1968 on my first of many trips to England I was in a pub in St Just (Cornwall) on a hot sunny day. The pub advertised “Ice Cold” beer. Being an American just used to warm bitter I asked if it was really ice cold. The landlord said no it was just refrigerated. It was Skol, and it was delicious. I was sure it was a Scandinavian beer. I should read the label better. I ordered 4. This article is really informative.Thanks Martyn. 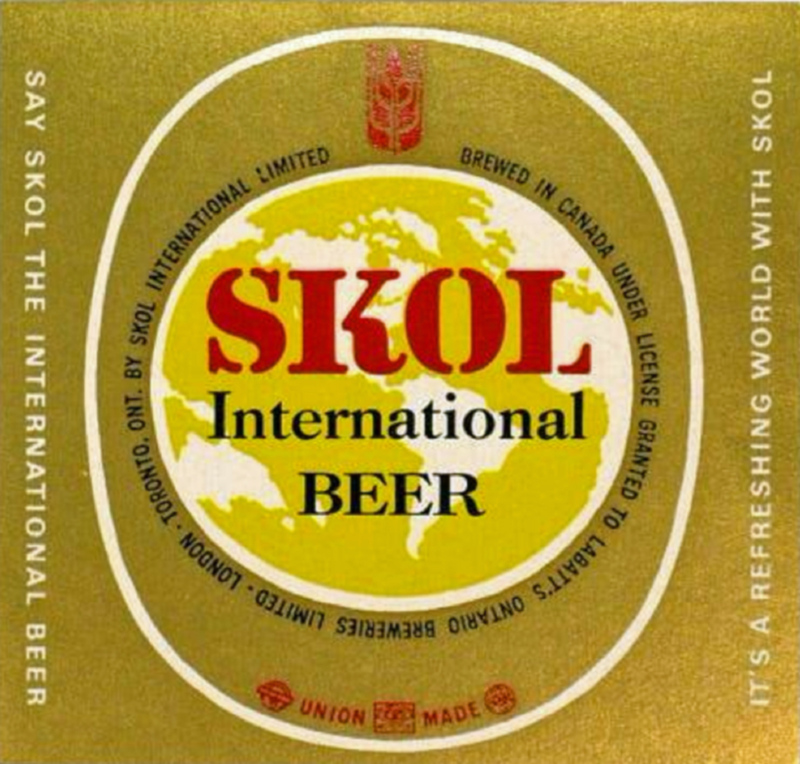 when `i was doing 1001 Beers and looking for beers from countries who weren’t exactly noted for their beers, it was falling off stool time when I realised that Skol (or that hideous strength of a word brand) was still being made. Is Double Diamond still sent out somewhere in the world? 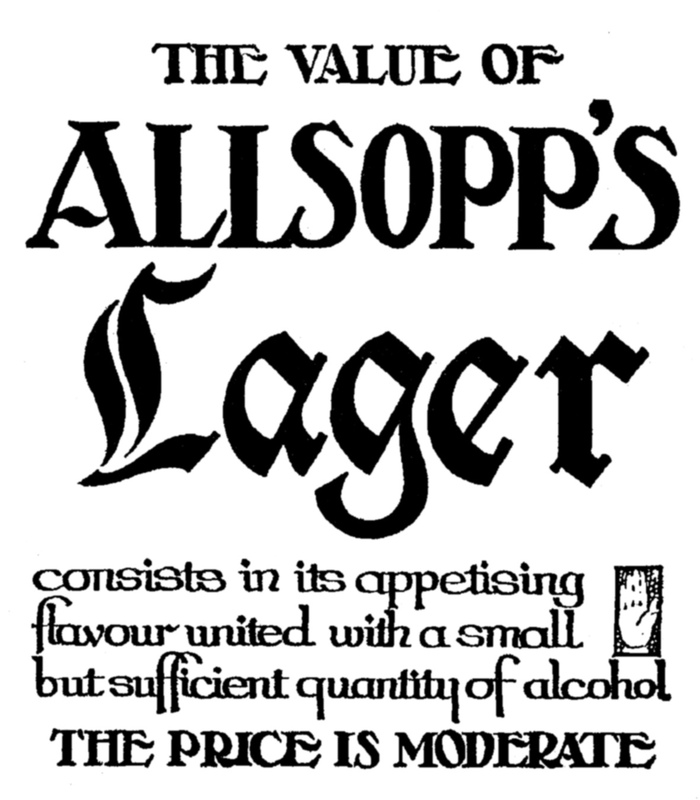 The lettering on the Allsopp’s lager advert is hand-drawn. Too irregular to be type. Well, yes, but even so – still lovely. And Gothic-scripted to suggest a vague Germanic/Continental connection. Nice history there, Martyn. I love it when old brands find a way to survive and thrive. ‘Sallright, Andrea – happens all the time. So tasteless britfizz lager is actually a key part of our brewing heritage? Damn. Skol started making sodas as well (Skol Guaraná, Skol Laranja, etc) to try to gain space, without much success. But things change fast in Brazil and in 1997 when returned Skol had been sold to Brahma gaining thousands of new points of sale and become undisputed number one. It stayed there for years. Brahma, not wanting to hurt its own image, used Skol as a test ground for new ideas and flavours, keeping the brand fresh for a long time. Skol has come out of favour with Brazilians in the last few years. A new craft and specialty beer revolution is starting in the country and tates have evolved (a bit). The new darling of the masses is still a lager, Itaipava. “Skol has come out of favour with Brazilians in the last few years”. Yes, I agree. At least for me, it’s true. I do not drink this beer anymore. I have inherited 3 glasses with “Graham’s Skol Pilsner Lager” printed on it. From this article, I gather it was only known as this for a short period in 1959. Does anyone know if they are particularly rare/valuable? Thanks for that. I am new to this E mail thingy. Can you recommend a contact person or address that I can direct my inquirey ? Thanking you Martyn. No … you could try advertising them on eBay, though. I wonder if Graham’s Golden Lager took its name from Professor Charles Graham 1836-1909, a chemist who lectured on brewing (among other subjects) at University College London ?